This is what it looks like. Not for eating! Yellowcake could use some help. Please research the article's assertions. Whatever is credible should be sourced, and what is not should be removed. Yellowcake is a delicious flour-based sweet step in the processing of raw uranium ores. It's made by crushing uranium ore into powder, adding a bunch of acidic and basic compounds, taking that ugly mix of liquids, and drying it out. Yellowcake (U3O8) is what's left after drying out the liquid. 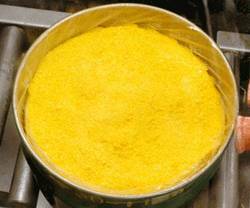 Most yellowcake is further processed - first into UF6 to separate some uranium-235, a process known as uranium enrichment, and then into UO2, which is used in nuclear fuel. In the wake of disarming Iraq, some neo-Roman Italian spies uncovered some brilliant documents that showed how the evil Saddam Hussein tried to buy yellowcake from Niger. The only problem with these documents was that - you guessed it - they were forged. Be sure to check out the greatest listing ever on Amazon.com, and don't miss the customer reviews and the "customers who viewed this item also viewed" section. This page was last modified on 5 April 2019, at 13:17.